Musical wunderkind Black Summer, otherwise known as Rhys Toms, is back with a luminescent new song Sadness, featuring Bahamian vocalist Chloe Campbell, set for release on March 23. The perfect followup to 2017's Young Like Me, which has racked up over three million streams across multiple platforms, Sadness is an exciting offering from the accomplished producer who is still yet to turn 15 years old. Black Summer has also dropped a truly spectacular video to accompany Sadness, directed by Tim Maxx. Sadness is perfectly crafted; undeniably hooky, with masterful production that sinks and swells around eighteen year old Campbell's expressive vocal. The track is steeped in heavy emotion, something that Rhys has woven within the music with the skillset of someone years his senior. The arrangement borders on subtle, yet percussive patterns and dense synths duck underneath the lead melody in impressive layers. Speaking of the inspiration behind Sadness, Rhys says, "Sadness is a track that I wanted to give a chilled but also energetic vibe to. It's about two people not quite connecting - one of them is in love with the drama of the relationship, but they can't figure out how to make it work. I wanted to relay this feeling in the track so I used these dark muted synths…we recorded Chloe's vocals in LA and then I took her vocals and further built the track around them. She brought this amazing life to the track with her awesome adlibs and harmonies." The clip for Sadness is epic, and sweeps the audience into the atmosphere in much the same way that the track itself does. Set in multiple breathtaking settings, Rhys walks across a desert, along a stormy beach, through a forest and into flames, following the elusive Chloe throughout the wilderness. Working alongside Tim Maxx who also directed the impressive Young Like Me clip, Rhys explains, "We shot the video while Chloe and I were both in LA…the story of the video is two people who are trying to connect but they can't get to the same place at the same time. Like in the song, they're in two different mindframes." It's been a wild ride for Rhys, since he was Unearthed by triple j at the tender age of 11 as one of the country's most exciting young producers. Young Like Me, his most successful release to date, was debuted on national television across Channel 9's Children's Hospital Telethon, and attracted a lot of international attention after being added to high rotation on triple j, and in its wake Black Summer appeared at Groovin' The Moo. 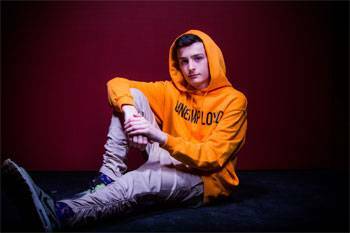 Now still only 14 years old, he has a fantastic attitude towards the industry and is thrilled to be working towards some live performances for 2018, saying, "I still can't believe that I'm doing what I'm doing now - it is literally a dream come true. I'm so grateful for the opportunity triple j gave me to get my music out there, they really gave me the confidence to do what I love! Over the years I have learnt so much about music theory and the industry… I love anything to do with computers, from programming video games to making my own music. I love to travel and see new parts of the world and performing live is one of my favourite things to do!" Question: How did working with Chloe Campbell, come about? Rhys Toms: I met Chloe through Tek (Tek is my mentor/label) when he showed me her music and I thought she was really cool and talented. So we both met up in LA and hung out. We got along really well and spent time in the studio recording vocals as well as filming the music video. It was great fun and a really cool experience. Question: Can you tell us about the idea behind the music video? Rhys Toms: Well originally it was Tim Maxx's idea (the director, who also filmed the clip for -Young Like me' my first single) the video follows the theme of the song, which I feel is about two people who are trying to make things work, but it's a toxic relationship and they aren't in the right place at the right time with each other. So in the video I'm trying to get to Chloe. Question: How have your music changed over the past 3 years? Rhys Toms: Wow my music has changed so much over the last 3 years because I have been constantly learning all the time, learning new instruments, about music theory and song structure as well as starting to find my own sound. I'm really enjoying it. Question: If you could have anyone, in the world, attend your upcoming show, who would it be? Rhys Toms: I would LOVE Skrillex, Flume or Getter so see my next gig as I am playing their music as well as my own. Question: What motivates you most when creating music? Rhys Toms: My studio really motivates me when being creative because it's a really cool space. It's an area that has everything that makes me feel pumped to work. Watching other artists performing live on YouTube really motivates me to keep creating because it looks like so much fun and I can't wait to perform my new tracks. Rhys Toms: At the moment I'm really into Misogi, Getter, Lil Peep and NGHTMRE. Rhys Toms: The first electronic artist that I ever heard was Skrillex, I thought his style had a really cool vibe to it and I had never heard anything like it before. I wanted to give it a try. Rhys Toms: I would love to collaborate with Misogi because I like his style. I like the unique instruments he uses in his songs and all the collaborations I have heard him do before are really cool.